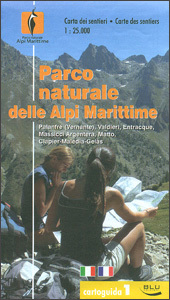 Parco Naturale delle Alpi Marittime in the southern part of the Italian Alps on a detailed, contoured map at 1:25,000 from Edizioni Blu, highlighting local hiking trails, huts and refuges, various facilities, etc. 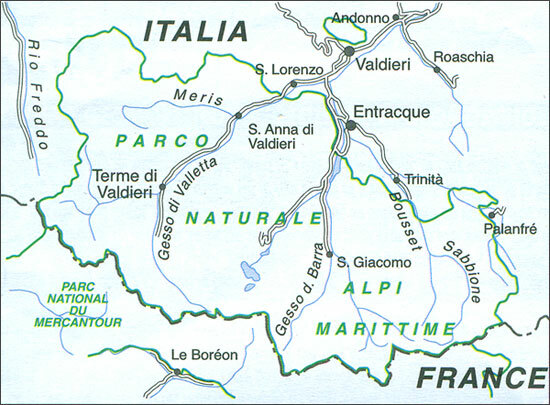 Coverage extends from the adjoining areas of the Mercantour National Park in France to the Juniperus Phoenicea Nature Reserve, indicating cross-border trails. The map has contours at 20m intervals, enhanced by relief shading. 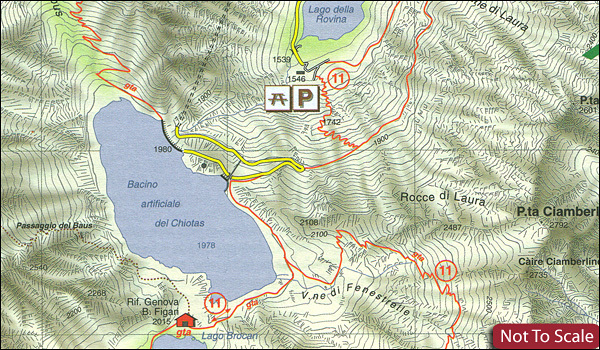 Highlighting for local trails indicated which routes have brief descriptions on the reverse and shows the course of the GTA – Grande Traversata delle Alpi. Symbols mark locations of huts, refuges, gîtes d’etape, campsites and other types of tourist accommodation, various places of interest, etc. The map has 1km grid lines but does not give their UTM coordinates. Map legend includes English. The reverse side provides extensive tourist information: descriptions of 20 hiking trails varying from one to seven hours, notes on five longer 2 to 6 days routes and four mountain bike trails, contact details for accommodation and other useful organization, plus general notes about the area. All the text is bilingual Italian / French.